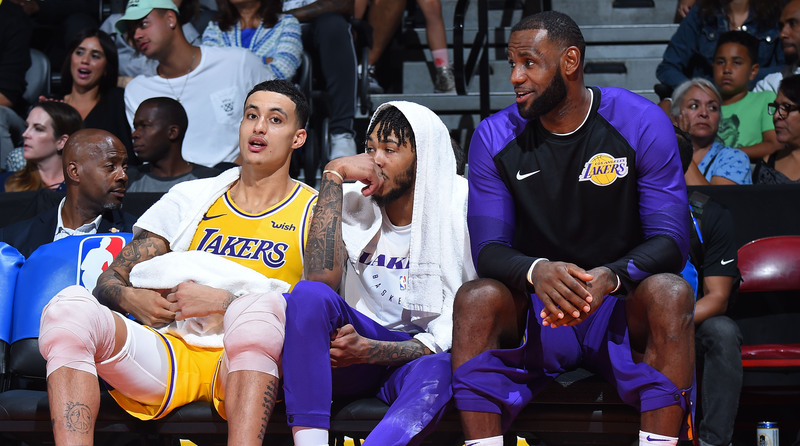 With a cast of LeBron James, Brandon Ingram and Rajon Rondo at the helm, outsiders are looking at the Lakers and wondering how they will play on offense. The Open Floor podcast crew digs into the details and the approach L.A. should take. LeBron James's tenure with the Lakers is still in its infancy, which means we have more questions than answers at the moment. One of the major storylines will be the brand of basketball the Lakers decide to play. Will they go with small-ball looks or play JaVale McGee at center? Does Brandon Ingram take on major minutes initiating the offense? How will Rajon Rondo and James adjust if the Lakers decide to take on a faster pace? The Open Floor podcast crew digs into these details and takes a closer look at what approach the Lakers must take to ensure their success. Andrew Sharp: The big men are really, really important to having a good defense and you can't just not have one, or you can't pretend that JaVale McGee is the solution there. You look at the Lakers' schedule, which we don't have to go through now, but it's pretty tough the first couple weeks. They're going to have to play the Spurs twice and deal with LaMarcus Aldridge, they're going to have to play the Blazers on opening night and Jusuf Nurkic isn't a world-beater, but he's going to have his way with Kyle Kuzma. I like the small-ball bet also, but I think it's a big risk and it's asking the offense to be really, really good to have a chance and that's a tough curve. Ben Golliver: Absolutely, and it's saying the pace has to be sky high, like faster than New Orleans played last year. Faster than maybe any team has played in recent years, and that is tricky to commit to, right? Running off of makes? That takes real mental commitment to do that time after time after time. Always pushing the ball in transition, even when you're tired, even in the middle of the fourth quarter or whatever it might be takes a different level of commitment. I think that's when they're at their best. I mean, the most entertaining moments of that game came early in San Diego, where the Lakers were just flying up the court, they were getting into their offense with 20-21 seconds left on the shot clock, they were getting pretty good shots, LeBron was whipping the ball around the perimeter. Things were really humming. That's when this Lakers team is at their best, and there may be questions: "Do they have enough shooters to make that tragedy work? Is their offense really capable of being as good as it needs to be?" Let's find those questions out through trial and error. Test that philosophy, right? Because if you're trying to put defensive players on the court with this team and trying to find balance by playing some size like Ivica Zubac, I think you've already kind of lost the bet. Could the NBA Force J.R. Smith to Cover Up His Supreme Tattoo? Sharp: I mean, yeah. I was a big Zubac guy for about two weeks I think two years ago, but he's not someone I would really put much stock in at this point. And the other thing I would mention is this: if you're talking about playing fast as the solution, LeBron works in just about just about every contest and it's easy to imagine him as the centerpiece of literally any style you want to play, but he hasn't really loved playing fast over the last few years. And the idea of playing fast with LeBron always sounds great but it never really comes to fruition. I'm interested to see how he responds to doing that for more than a couple weeks in a row, you know what I mean? He's going to have to be great and borderline superhero-ish to make any of this work, and maybe he can do that but it's a pretty crazy challenge. Golliver: No doubt. I mean, the dirty little secret of LeBron and Rajon Rondo is that as incredible as they are as passers they both like to ball stop a little bit. They both like to pound and kind of think and slow things down, and Rondo was actually able to break out of that pretty consistently at times last year and I think that was a maybe thing that kind of fueled New Orleans's success. He has to really commit to push, push, push constantly. If they get into the halfcourt he's kind of just bouncing the ball around and everyone else is sort of running through their players, that's not going to work very well for L.A.
Do the Pelicans Have Enough Talent to Satisfy Anthony Davis? And the same thing for LeBron. I think he's obviously in the condition and shape he needs to be in to push up and down, but when you're in a late-game scenario all your habits take over. It's like, "OK, I want to go and post a guy up one on one and slow this thing down. If you can't defend and get stops on the other end in a slower-style pace, all your offensive brilliance is going to wind up going to waste. So I think we found some really major philosophical questions for the Lakers. How often do they stay big versus how often they stay small? And how completely can they commit to playing a high speed brand of basketball. I think those are going to be their defining questions all season long.